For 2011, the Dodge brand's ultimate modern American muscle coupe receives a big boost in power and performance. And the product story goes beyond the impressive horsepower and torque lurking under the hood. The new Dodge Challenger SRT8 392 builds on its original mantra of a rear-wheel-drive coupe that promises a balanced approach between form and function, with impressive straight-line acceleration and world-class ride and handling to go along with high-performance braking and the latest technology that delivers improved fuel efficiency. The result is the newest version of the quickest coupe in the Dodge lineup packed with modern amenities and features performance enthusiasts will love. "We listened to our devoted, loyal Dodge customers, and this new Dodge Challenger SRT8 392 answers their call for more power off the line," said Ralph Gilles, President and CEO -- Dodge Brand, Chrysler Group LLC. "We consciously tuned the 392 for a lot more torque, as that is what truly creates the thrust that sets you back in the seat and keeps you there! We can't wait to see our customers' reactions when they get behind the wheel and put their foot on the throttle -- it is so responsive and a blast to drive." 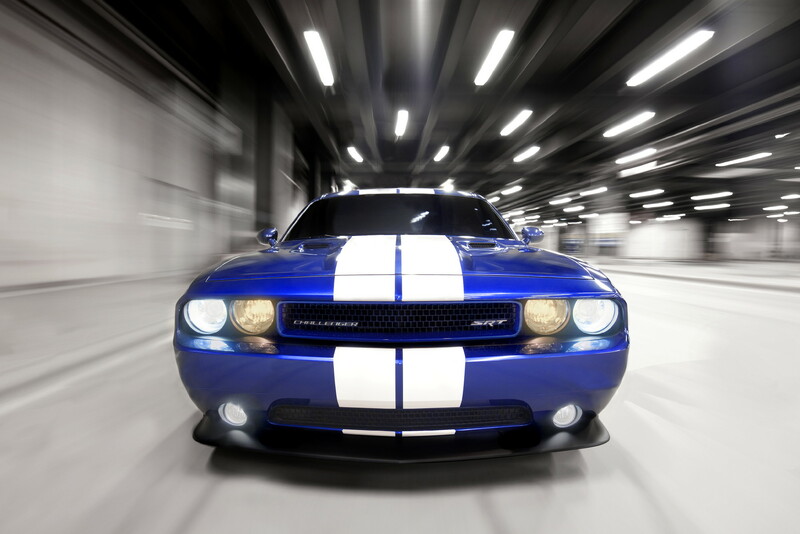 The return of the legendary 392-cubic inch HEMI powertrain back to the street in the Dodge Challenger SRT8 392 provides another step in showcasing the evolution of the performance brand. 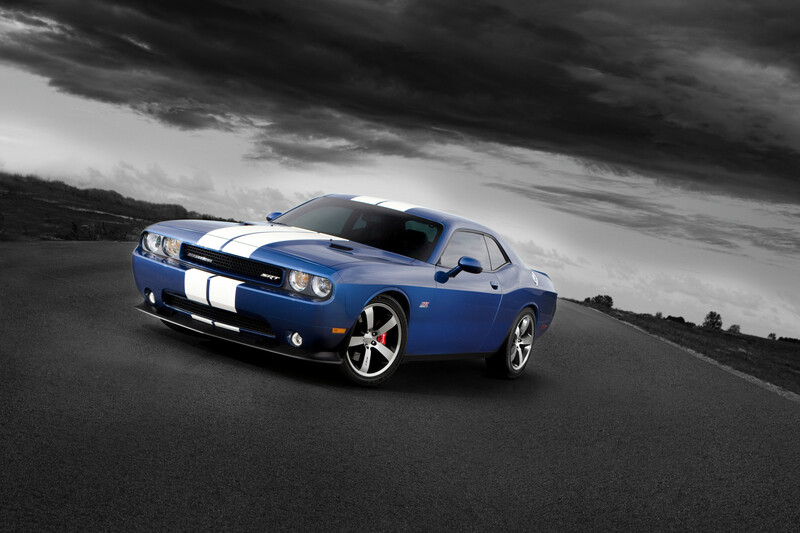 The 2011 Dodge Challenger SRT8 392 is available with either the standard five-speed automatic transmission with Auto Stick or an available Tremec TR-6060 six-speed manual transmission that was first offered on the 2008 Dodge Viper SRT10. An improved heavy-duty clutch provides easier shift engagement. 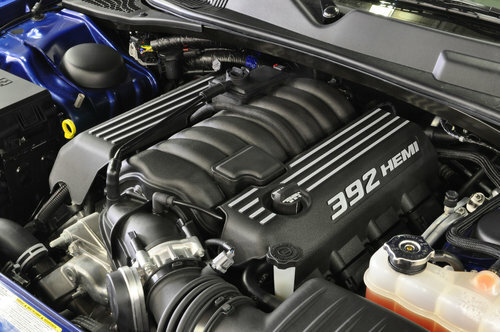 Under the hood, unique valve covers with painted silver ribs and the "392 HEMI" logo give the HEMI powerplant a clean, yet aggressive look. 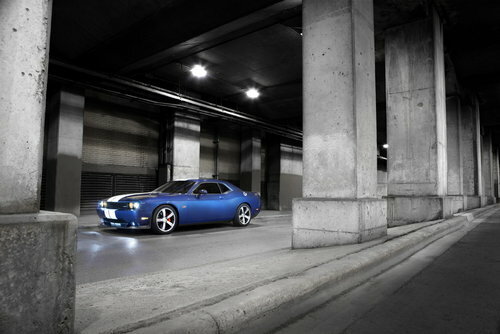 To kick off production of the 2011 Dodge Challenger SRT8 392, 1,492 Inaugural Edition models (1,100 for the U.S. and 392 for Canada) will be produced featuring exclusive exterior and interior content. On the exterior, two colors and new full-body stripe combinations are available on all Inaugural Edition models: Deep Water Blue with standard Stone White stripes or Bright White Clear Coat with standard Viper Blue stripes. For the first time, the front grille features a body-color grille surround. 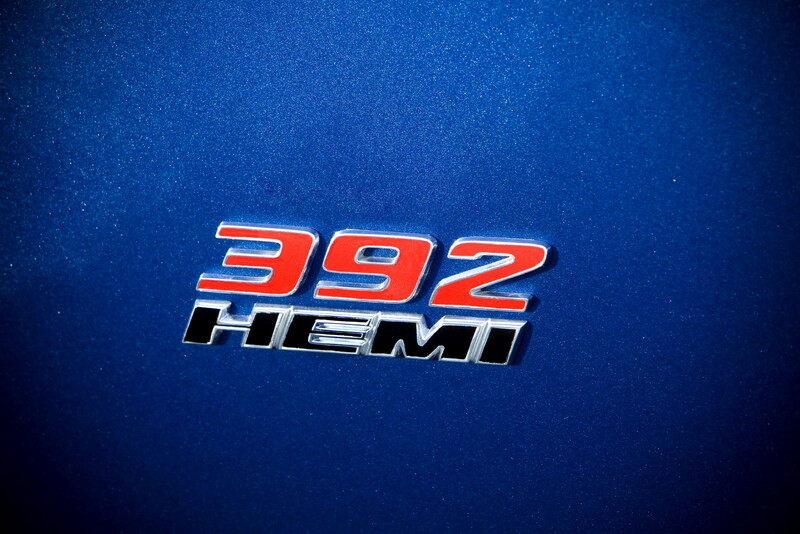 Unique "392 HEMI" badges flank both fenders touting the historically significant V-8 engine that remains true to its high-performance roots and powers the highest rated Challenger in terms of horsepower and torque ratings. 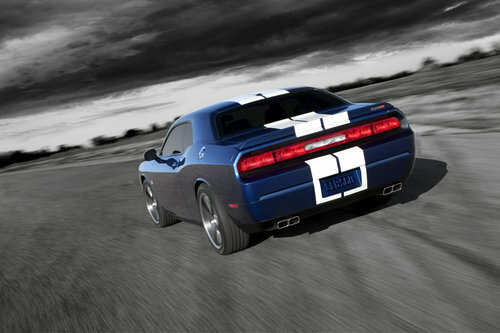 From the rear, the Mopar quad exhaust tips deliver the performance exhaust note while adding the styling cue of a serious muscle car. 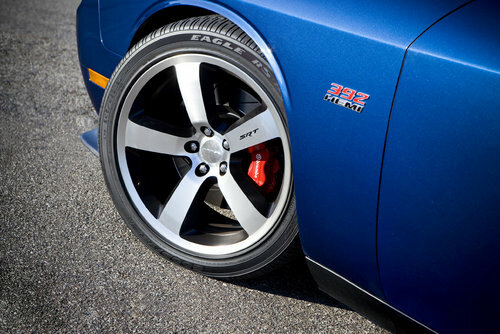 The Challenger SRT8 392 Inaugural Edition rides on standard 20-inch SRT exclusive wheels that feature a polished face and satin black painted pockets. 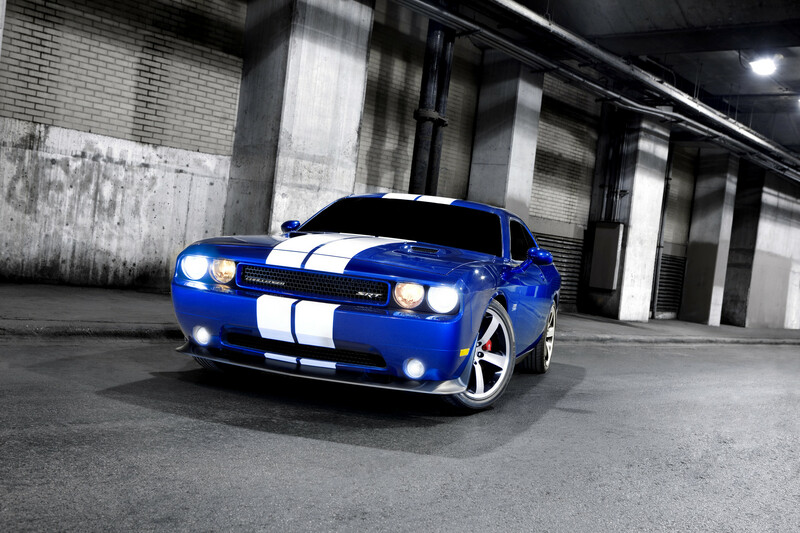 The race-inspired interior of the Challenger SRT8 392 Inaugural Edition begins with standard Smooth Pearl White leather-trimmed seats and dual blue stripes accented by unique blue stitching. Each of the front seats features an embroidered "392" just below the headrest. The center instrument panel, center stack and console bezels feature a silver metal brush finish for a clean yet high-performance look and feel. The door trim panels also feature silver metal brush grab handles inside Pearl White door bolsters with unique blue accents. An exclusive, serialized "Inaugural Edition 392 HEMI" dash plaque, showing the sequential build number from 1 to 1,492 rounds out the exclusive interior content. 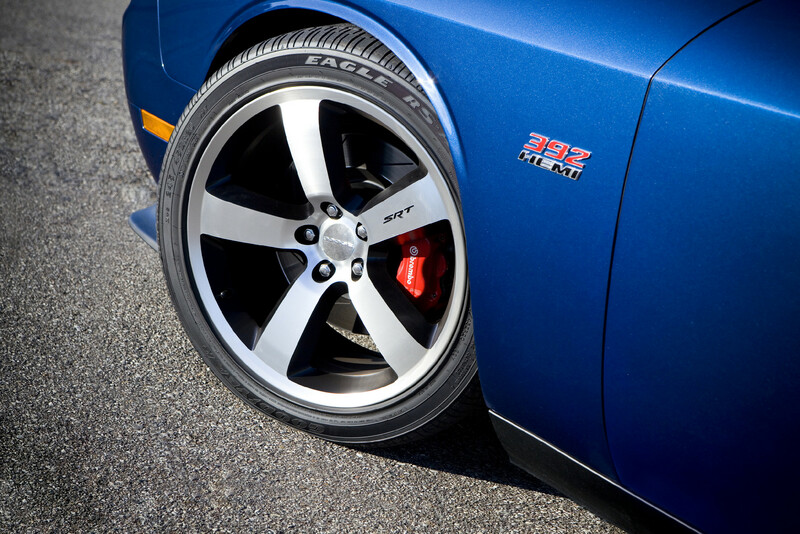 The precise performance handling of the Challenger SRT8 392 comes to life through a new, right-sized, three-spoke steering wheel that features a carbon fiber accented leather wrap and silver metallic painted spokes at the 3-, 6- and 9 o'clock positions. 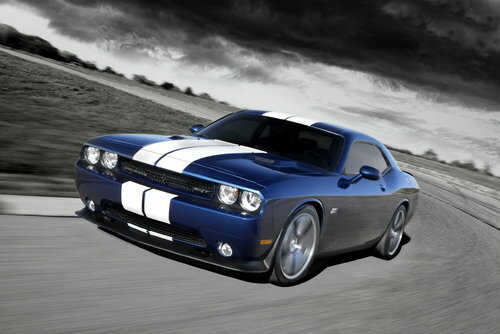 Power lumbar-equipped front seats are standard on all Challenger SRT8 392 models. It's also much easier to get in and out of the rear seat. The driver's seat now features seatback tilt with memory and an easy to reach release handle, while the front-passenger seat adds tilt and slide with memory, which makes it even easier to use. New, highly damped shocks offer a firm ride that maintains the feel for everyday commuting while being fully capable for the more challenging situations. SRT engineers recalibrated the suspension geometry to improve Challenger's balance, cornering ability and steering responsiveness. Quicker steering ratios and new negative camber settings all around dramatically improve Challenger's appetite for high-speed cornering. The result: the 2011 Challenger SRT8 392 is capable of .93g on the skid pad -- the most of any production Challenger and on par with some of the world.s best-handling performance coupes. The original 392 HEMI engine was introduced in the new 1957 model year Chrysler and Imperial products. It replaced the 354 cubic-inch version of the original HEMI launched in 1951. Compared with the 354 engine, the 392 was completely revised and improved, with larger valves and ports, a beefier block and crankshaft and improved bearings. 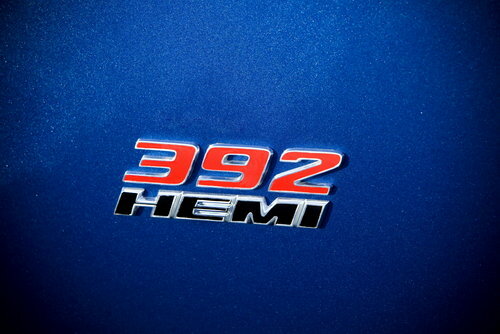 In short, the 392 HEMI, often affectionately referred to simply as the "92," was perfect for drag racing. More than a few racers at that time immediately enhanced the performance of the newest HEMI by bolting on six or eight carburetors, installing new camshafts, etc, and went racing. Racing legend Don "Big Daddy" Garlits ran a 392 in his infamous Swamp Rat I dragster at record speeds of faster than 180 mph on nitro with no supercharger. Garlits also used a 392 HEMI to officially break the 200-mph barrier when his Swamp Rat went 201.34 mph at Atco, N.J., in 1964. But the 392's success went beyond the drag strip. It also set records at the Bonneville Salt Flats and in boat racing. Drag racing boats were no different than their land-based counterparts in the use of the 392. Famous HEMI engine builder Keith Black was better known on the water than on the land, until he teamed up with Tommy Greer and hired Don "The Snake" Prudhomme to dominate Top Fuel in California in the early 1960s using a 392 HEMI. 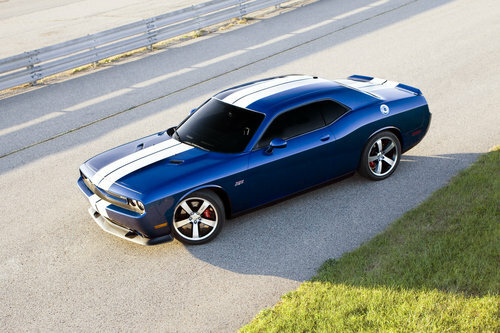 In 2007, Mopar -- Chrysler Group LLC's service, parts and customer-care brand -- helped celebrate the 50th anniversary of the original 392 by launching a modern, crate engine version of the 392 HEMI.